Does anyone know if these guys were scratch built by Adrian Carmack or if they were photo scanned from some other source. As far as appearances goes they stand out from the rest of the sprites and graphics in Doom and have a bit of a " too realistic " appearance to them, making me believe they're likely scanned from an actual image. Their apparel almost looks to be World War 2 era military fatigues, either German or American. If anyone knows or suspects where these dudes are from, please say so. Otherwise we can at least speculate. My guess is that they could be WWII casualty photos. Here are the dudes in all their glory, just in case you're unsure of what I'm referring to.. The one in the middle kinda looks like Mussolini. After his execution, his corpse was exhibited hanged by the feet. The clothes largely match. They were scanned from real life pictures. I remember reading an article on it, and it showed the real pictures. Can't find it though. Yeah, heard about Mussolini‘s execution as well. Kinda macabre, if you ask me and what I always disliked about those props is, how they don‘t fit too well, with the other hanging victims, which look more „pixel art“, whereas the ones in your post are straight up photos. There has yet to be any corroboration of the claim that these graphics were based on scanned photos of Mussolini's corpse or any other real life hanging photographs. All it would take to confirm this notion would be to find the same photo that was supposedly scanned in, and that shouldn't be a tall order since this was a famous historical event that received limited recorded coverage in its time. However, no one has yet to supply the exact photo here, and the photos we do have clearly don't match Doom's sprites. 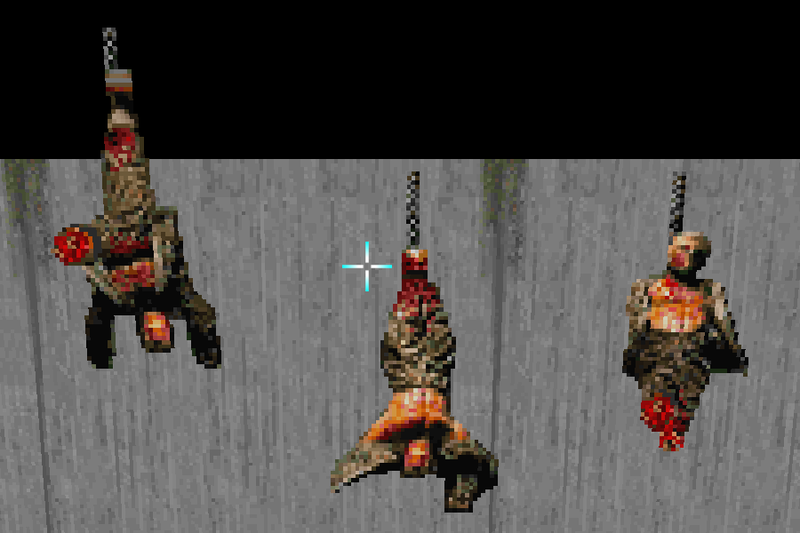 It is more likely that these hanging corpses in Doom were hand drawn by either Adrian or Kevin. This is supported by the fact that we actually have the early version of one of these sprites courtesy of the Jaguar port, among several other less refined patches. But come on, the ones that ended up in Doom don't look hand pixelled at all. This is exactly my gripe with them. That early version you posted looks way more handdrawn and is actually quite nice. I want this now. Also that GSTONE looks quite cool. Are there more differences like this in the Jaguar port or Doom alphas?! Yeah the Jaguar textures actually fit into the rest of the graphic style of doom. The hanging victims that were released in the offical game looks so grainy and detailed, as if they weren't cleaned up at all. I always thought these were some of the coolest sprites in the game. I prefer them to the somewhat bland Jaguar version. I also think the SP_DUDE's sprites look as if they were digitized from a real photograph. They have the genuine appearance of a Sega CD FMV or something similar. Check the dude's face on the far left for example. The color of the texture is mismatched all over the face; the darker parts of the face seem pink while the lighter parts are much more washed out and yellow. Also, the blood is not a consistent shade of red either. 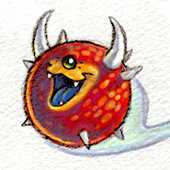 This tells me that this image was not originally drawn in Doom's palette. I will also say that it looks stitched together from different images. The head sprite is actually pretty consistent (if not identical, just mirrored) between the left and middle sprites. This is supported by the fact that we actually have the early version of one of these sprites courtesy of the Jaguar port, among several other less refined patches. I wouldn't call the Jaguar texture an early version of the other. It's completely different: the proportions are different, the details are different, the colors are different, the graininess is different, the art style is different. You can quickly check on Google the Mussolini hanging pictures, not that I recommend, but it would match a lot more with his mistress, Claretta Petacci, who was hanging beside him. That is, if this theory holds any water. I'm not convinced so far. I thought they used GI Joe action figures? The one-legged dude is always clipped above ceiling. It's freaked me out. If it was based on those bodies, then it wasn't this exact photo. 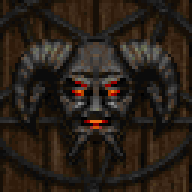 This suggested notion ties to the fact that all art changes to the existing sprites starting with v1.666 (Doom 2's initial release) can be attributed to errors. The Baron of Hell's BOSSF# frame reverted to an earlier alpha version (much brighter horns and hooves), an accident likely occurring when id was working on the Hell Knight's sprites. 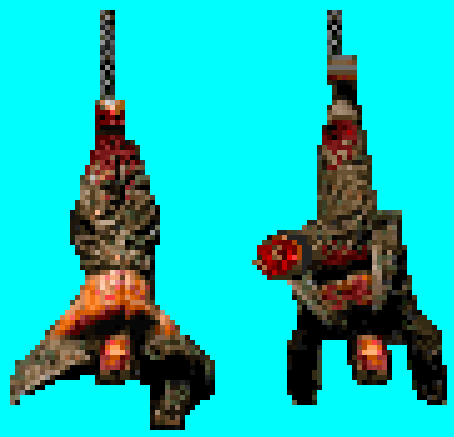 Similarly, the Baron's legs in its death animation were inadvertently recolored to match the Hell Knight's, making the link between these newly-introduced errors and the new Doom 2 sprites fairly clear. The Lost soul's front-facing walking sprites (and only the front-facing walking sprites) were changed in 1.666 as well, likely also an accidental reversion to an earlier alpha version similar to the Baron's case due to the sheer myriad of obvious errors on display. Like with how the Hell Knight led to the Baron errors, this reversion can be ascribed to editing the Lost Soul sprites to make the Mancubus' new fireballs. For the Jaguar port (the development of which largely coincided with the end of Doom 2 and v1.666), note that id now had to reprocess all of the existing wall textures in Doom in order to abandon the patch system. This resulted in a number of seemingly inexplicably texture changes alongside most (but not all) of the aforementioned v1.666 sprite errors. The question is, what was the cause for these changes? You can basically chalk it up to one of two theories: the team actually pulled Adrian and Kevin away during the hectic and rushed Doom 2 development to dedicate their time towards making some largely trivial wall texture modifications (most appearing to be simplified downgrades) that would only be reflected in their Jaguar port release, or rather they somehow simply managed to revert numerous texture to earlier and unrefined versions during the porting process, something we already have clear and demonstrable evidence of occurring before elsewhere in the form of the above mentioned v1.666 Baron sprites. The former possibility certainly isn't out of the question since we can't rightly declare anything for sure, but it's as silly as it sounds. Regardless of what one wants to believe, it's really no secret that a lot about Doom 2 and its surrounding elements were rushed out, and that's readily apparent enough in the end product if you know where to look. Attributing these Jaguar texture changes to unintended art reversions is not a big leap (and, again, we have definitive proof of id doing precisely this beforehand), and this oversight just fortunately happens to give us a little insight as to the lineage of the hanging corpse artwork in question. It's clearly the same base sprite as evidenced by the folds in the pants, the alignment of the belt line, the crease in the chest, and so forth. You can even see a handful of pixels are 100% identical between the two. The question at hand is when and why it changed so radically. Oh now it makes a lot more sense if the body parts were mixed, indeed. The pants for example do indeed look like his. This is the main source that's been floating around proliferating this claim, yet its own presented evidence fails to offer any real support. You only need look at the photo to see that Petacci's body doesn't match the Doom sprite, nor would this explain where the parts for the rest of the similar hanging body sprites (GOR1A0, GOR3A0) came from. Mussolini's legs look similar, but that's discounting the angle of the photographer, the lighting, the folds in the pants, and so on. If the sprite was based on a scanned photo, it certainly wasn't this one. Note that both of these hanging corpse sprites appear to be wearing the same open shirt/vest, but there's a key difference. The GOR2A0 sprite on the left (supposedly Petacci) has the vest hanging down past the figure's head, as you'd expect gravity to affect a body being hung by its feet, but in the GOR3A0 sprite on the right, the vest is hanging loosely by the figure's sides, as if it was originally an upright body that was reversed. That certainly couldn't have come from the day of the public hanging. Well, to me they look like someone applied the 'sharpen' tool, not necessarily that they're raw scans of photos. Notice how the current GSTONE1 also looks sharper than that one from Jaguar. It's almost like the artist felt he wanted the graphics to be sharper that day. I don't mind the hanging Mussolini allegation though, especially given that id already pushed a succesful politically loaded franchise (Wolfenstein), showing fascists suffering in hell is not bad either. Even if the artists didn't scan those photos, you can assume they were inspired, even if involuntarily. I think that image was quite popular. Even if the artists didn't scan those photos, you can assume they were inspired, even if involuntarily. I think that image was quite popular. There are good claims on either side of the argument so yeah, I think this is the best way to look at it unless we magically know more about the creative process. It's clearly the same base sprite as evidenced by the folds in the pants, the alignment of the belt line, the crease in the chest, and so forth. You can even see a handful of pixels are 100% identical between the two. The question at hand is how and when it changed so radically. The similarities in the legs can be better explained if the Jaguar version was a half-finished attempt at drawing an actual sprite while the PC version is just the digitized photo edit. It's important to keep in mind that these graphics look nothing at all like the rest of the gore in the game. Notably, they don't look like the impaled guy (which is clearly based on a player/zombie sprite), like the tortured baron in the SP_ series, like the skulls on pikes, or like the added Doom II gore. Here's a montage. There are things that fit together graphically quite well. And others that don't. You'll notice that Jaguar does have a few unchanged PC textures/sprites, like the leg or the guy hung by the neck on the marble wall. the vest is hanging loosely by the figures sides, as if it was originally an upright body that was reversed. Yes, they've mixed and matched various photos. And the mutilations are likely edits. Oh, @Gez that's cool, there is even a crucified version of that "pixel art"-ish sprite. I just made myself a wallpatch of the upside down one with the proper GSTONE as background. Will make myself a crucified version as well. They definitely seem to come from a photographic source - Gez's montage is good for showing them in context. The coloring and the sharpness of contrast are characteristic of other stuff that went through the NeXT camera. The only thing that doesn't make much sense to me is that most of the Mussolini photos are black-and-white, so I don't understand where the weird coloration in the sprites came from - unless they were photographed from a colorised photo? EDIT: Assuming the Mussolini thing is true then the World War II origin is interesting. I wonder if there's maybe a photo book that one of the id artists bought while working on Wolfenstein that ended up being reused. I'm still not entirely convinced they're from the Mussolini hanging photos as there's so many details that don't add up. Although it seems to be the most plausible theory since nobody has found a photo that exactly matches the poses the sprites are in. I still suspect some of them could be war casualties that were photographed lying on the ground, as the position of their jackets and limbs don't all correspond with gravity, especial GOR3A0. They look as if they were flung in the air by an explosion and landed with their clothing pulled apart and some of their limbs outstretched, or they were possibly dragged out of the way to the side of a road or some such. I was also starting to suspect this too as they all seem to be wearing the exact same clothing and their heads all seem to be similar. Also the very muscular/built torsos seem to match up with those of GI Joe dolls, not the famous 80's kind, but the 1 foot tall historically accurate kind. This is from multigen.txt, included in the Doom utilities released by id Software. However, the object in question has a sprite made from one of the dying player/zombie sprites, which were based on a custom clay model, not a G.I. Joe toy. face is the same, but flipped, and the art to the right they blatantly filled one of the arms with black brush. we're talking about guys that could make actual models of some of the most complex sprites and 3d scan them, I wouldn't be surprised if they would be that good at mixing up elements together in computer graphic tools. the pants from the sprite to the left has too many rendered elements, so many shiny details in the pixelage that I don't think anyone would take time to add manually. they definitelly used different stuff from actual photos and used the early version you mentioned as reference to center up things, 'cause I can see the resemblance, especially in the torso. don't know how they coloured the sprite tho... probably gathered colour based on the blacktones. you could kinda see it gets greeny from the very linear point where the vest starts, as if different colourings were used to fill the the vest, the torso and the legs. just my rough guesses here. It's hard to say IMO, my theory is a mix of the hand-painted, and Mussolini theory: Adrian (or even Shawn, IIRC he helped out with some textures, and even maps) used that Mussolini image, merged his legs with the top half of Clara, downscaled it and used it as a base for re-spriting, and used parts of it, but mostly remade it for the Jaguar port. So this is for the twitching impaled zombieman? The arrangement of frames and use of the GOR shortname instantly make me think of the hanging twitching victim, which has 3 frames of animation with frame B being repeated to add up to 4. The impaled zombieman only has 2 frames and is in the POL set of sprites if I remember right. I could be totally misunderstanding what you’ve posted though, it’s entirely possible. a quick look in the IWAD shows that GOR1 is the twitching hanging guy with his legs lopped off. He really doesn't look like any GI Joe toy I've ever seen, but he does look kinda plastic-y I guess. I wonder if G.I.Joe is just supposed to be slang for a military man, but that also seems pretty thin since none of the hanging guys look that much like soldiers. I dunno.